The Rotary Club of Kintore, Kimnay & District collected £301.22 for Children in Need at their local supermarket. 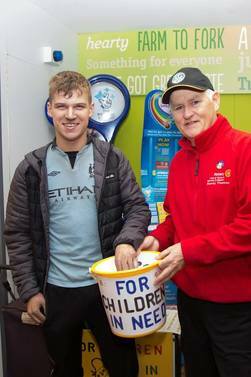 You can see Kenny Thomson accepting Jordan Cooper's donation to BBC Children in Need in the photo opposite. Victor Nicol, Doug Garden, Jim Thomson and Brian Shanks all took a spell during this all day fundraiser. The Rotary Club of West Fife hold an "Ultimate Quiz" each year to raise funds for charities and this year, donated £2,000 to BBC Children in Need. The picture shows the winning team. Congratulations! 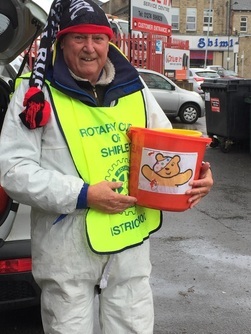 The Rotary Club of Shipley collected £3,042.24 for Children in Need at two busy junctions one at Baildon and the other at Windhill. The Rotary Club of Kinver hosted their annual "Alan Dedicoat Quiz". 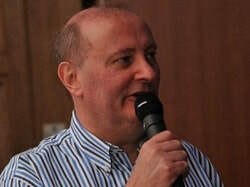 BBC’s “Voice of the Balls” Alan Dedicoat has hosted the quiz for the past 17 years. The final total raised for the evening was £1,125. They raised an impressive £1,830. The Rotary Club of Cambridge organised a spotty collection at Cambridge Train Station. The Rotary Club of Cambridge Rutherford organised two collections in the shopping centre. ​They raised a tremendous £1,901. The Rotary Club of Cambridge Sawston organised a collection at their local supermarket. ​They raised an impressive £1,442. The Rotary Club of Royston organised a great street collection. ​They raised an extraordinary £3,712. The Rotary Club of Bourne End & Cookham visited 7 schools with the official Pudsey Bear between 13th and 16th November. They organised Giant Pudsey Raffles in local businesses. The Rotary Club of Burnham Beeches visited 10 schools with the official Pudsey Bear between 13th and 16th November. 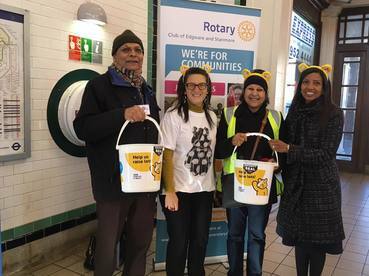 The Rotary Club of High Wycombe held a bucket collection at High Wycombe Train Station from 4-7pm on 17th November for BBC Children in Need. They raised a total of £506.21. The Rotary Club of Marlow Thames visited 4 schools with the official Pudsey Bear between 13th and 16th November. The Rotary Club of Misbourne Matins visited 10 schools with the official Pudsey Bear between 13th and 16th November. They raised a total of £8,249.49. The Rotary Club of Misbourne Matins and Rotarians, Rotaractors and Interacters from District 1090 descended on Heathrow Airport once again on 17th November 2017. Denis Spiller, RIBI President 2017/18 made a visit to meet collectors and Heathrow staff. We bumped into CEO of Heathrow Airport, John Holland Kaye in Terminal 5, as pictured. The Rotary Club of Reading Matins' Interact Club at the Wren School organised a cake bake and non-uniform day to help raise funds for BBC Children in Need. ​They managed to raise an impressive £515.10. The various Rotary Clubs in Reading collected at Reading Train Station. They manned the 3 entrances with 6 Rotarians throughout the day. ​They managed to raise £4,277.21 for BBC Children in Need. 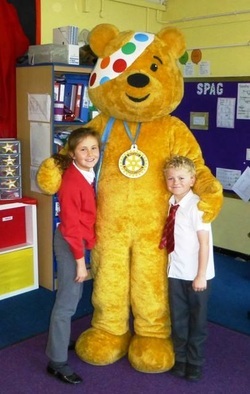 The Rotary Club of Witney organised visits to their local schools with the official Pudsey Bear. The children absolutely loved it and helped raise funds by dressing in spotty clothes. They raised £453.50 for BBC Children in Need. The Rotary Club of Edgware & Stanmore collected at Edgware Tube Station as part of a new partnership between BBC Children in Need and TfL. They raised £241.50 for BBC Children in Need. The Rotary Club of Roding visited local schools and their local supermarket with the official Pudsey Bear. As you can see, they had a great time and the kids loved it. Overall they raised £2,673 for Children in Need. The Rotary Club of Woolwich collected money off travellers at Charing Cross Tube Station. They raised £373 for BBC Children in Need. The Rotary Club of Chichester Priory held a collection with the official Pudsey Bear in Chichester on 17th November 2017. They raised an impressive £1,639.17 for BBC Children in Need. The Rotary Club of Horsham organised a huge Pudsey Party in Horsham Town Centre during October Half Term with Dave Benson-Philips providing music for the children, a steam bus providing tours of the town, Fast and Furious cars on display and a local bird sanctuary brought along some birds of prey to hold. The Rotary Club sold official Pudsey merchandise from their stall and also in November at the town market. The BBC sent a film crew down to capture some footage to be used on BBC1 on 17th November 2017 during the appeal show. They reached an impressive £4,000 total funds raised. The Rotary Club of Littlehampton held a street collection to raise funds for BBC Children in Need. 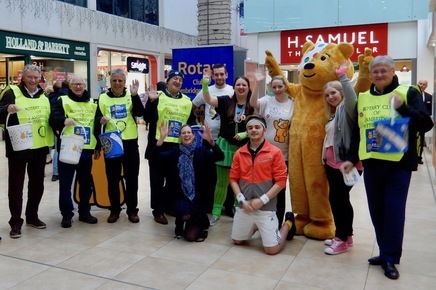 The Rotary Club of Woking & District held a street collection at their local shopping centre. They raised £1000 for BBC Children in Need. 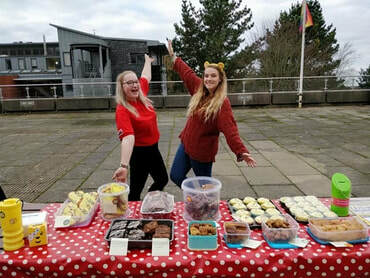 The Rotaract Club of Aberystwyth held a bake sale, selling a variety of homemade cookies, cakes and other baked goods, baked by members Dimitra, Kira, Rhianna, and President, Michelle. Treasurer Jack also helped man the stall. One member, Mark, dressed up to offer people selfies with the wonderful Pudsey Bear around Aberystwyth University campus, which is where the bake sale took place. 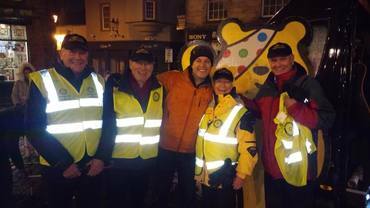 During the evening, Mark and secretary Connor offered more selfies with Pudsey in the Town Centre and to the partygoers of Aberystwyth's night life. Overall they raised £385.51 for Children in Need and they hope to outdo themselves next year! They raised an amazing £2000 for BBC Children in Need. The Rotary Club of Southport Links collected donations from shoppers at their local supermarket ably assisted by Greenbank School Southport Interact. President John Tarpey is in the Tabard with Pudsey alias Vice President Patricia McAuliffe. They raised a staggering £3,100 for Children in Need! They raised £985 for BBC Children in Need. The Rotary Club of Penrith took part in the Rickshaw Challenge as it passed through on the way from London to Glasgow. 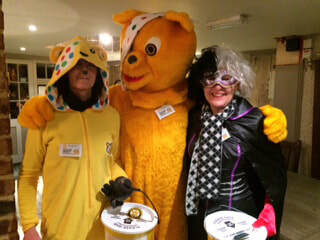 They raised £1,500 for BBC Children in Need shaking buckets at the event. They raised £1,300 for BBC Children in Need. Altogether they raised £2,447.20 for BBC Children in Need. ​They raised £1,103 in total. ​They raised £1,060.05 in total. 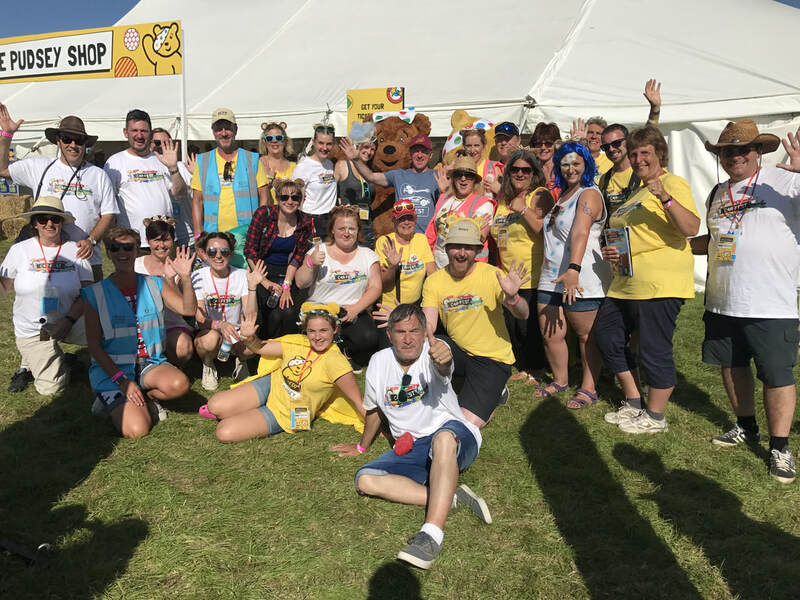 Rotary sent volunteers along to the Car and Music festivals in aid of Children in Need, set up by Chris Evans. A total of £80,000 was raised by the raffle over the two events, one at Bolesworth Castle, Cheshire, the other at Laverstoke Park Farm, Hampshire. The picture on the right is from Carfest South 2017. The picture below if from Carfest North 2017.